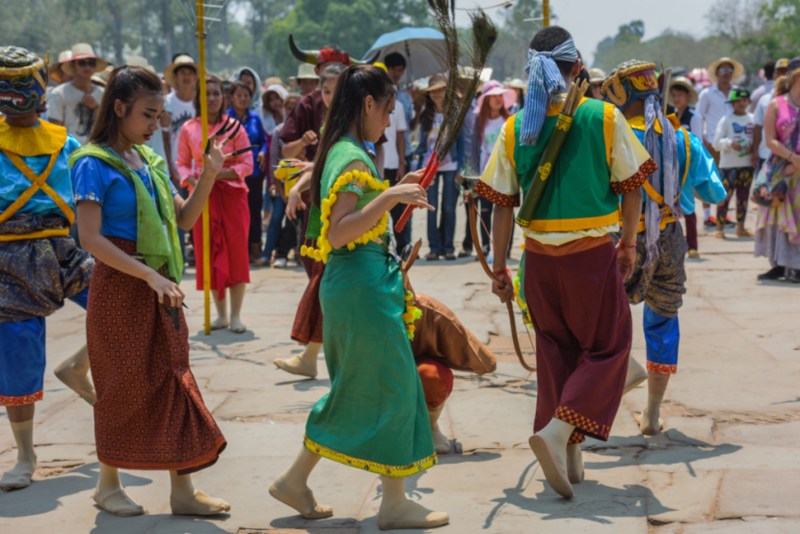 Cambodians traditionally greet with a Sampeah, which involves pressing the palms together before the chest with a slight bow and greeting with a polite ‘Chumreap Suor’. Customarily, the higher the hands are held and the lower the bow, the more respect is conveyed. Except when meeting elderly people or government officials, between men, this custom has been partially replaced by the handshake. Women usually greet both men and women with the same traditional greeting. Although it may be considered acceptable for foreigners to shake hands with a Cambodian, it is more appropriate to respect the custom and respond with a ‘Chumreap Suor’. Khmer Bokator , known formally as Labokatao, is a Cambodian martial art form that involves close hand-to-hand combat, ground techniques and weapons. 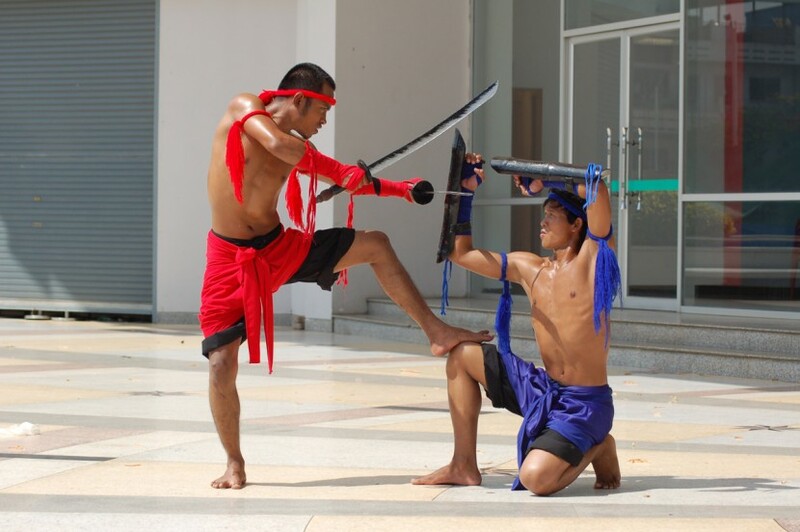 Bokator is one of the earliest Cambodian martial art and is said to be the close quarter combat system used by the armies during the Angkor era. Practitioners are trained to strike with knees, elbows, hands, feet and even the head. Short sticks are commonly used as weapon. Baok Chambab is Khmer wrestling a sport in which two opponents try to pin (hold) each other’s back to the ground. A match consists of three rounds. Wrestlers perform pre-match ritual dancing. A wrestler wins a match by two out of three rounds. However, after each round, the loser is asked if he still wishes to continue with the match. Khmer Pradal Serey is traditional Khmer kick boxing. A match consists of five rounds and takes place in a boxing ring. There is a one or two-minute break in between each round. Before a match, boxers perform the praying rituals known as the Kun Krou. Traditional Cambodian music is played during a match. The instruments used are the Skor Yaul (a drum), the Sralai (a flute-like instrument) and the stringed Chhing. Boxers are required to wear leather gloves and shorts. Traditional Cambodian weddings are intricate affairs that consist of multiple ceremonies lasting three days and three nights. The wedding begins with the groom and his family traveling to the bride’s home bearing gifts to the bride’s family as dowry. Family members and friends are introduced, and wedding rings exchanged. Customarily, three traditional songs accompany this first segment; the first song announcing the arrival of the groom and the next is on the presentation of the dowry followed by a final song to invite the elders to chew Betel Nut, an age-old Khmer tradition. Then it is the Tea Ceremony, at which the bride and groom offer tea to the spirits of their ancestors. The finale is the most memorable segment of the wedding. 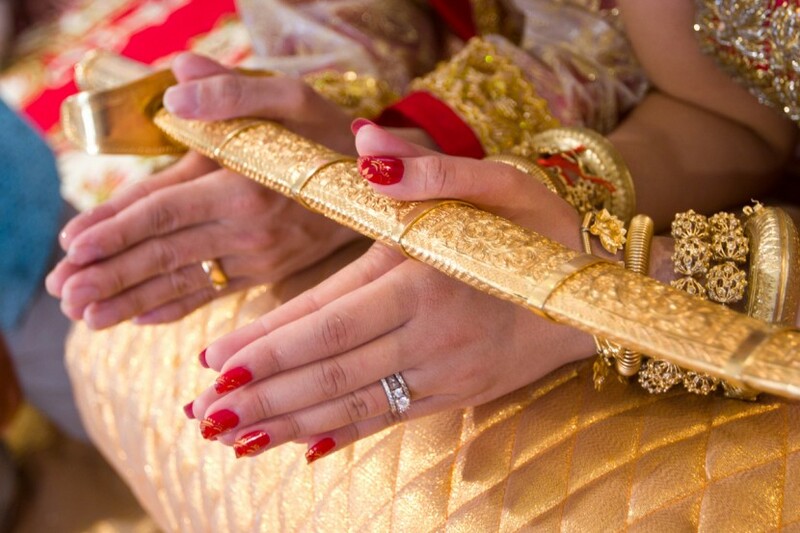 Family members and friends take turns to tie the bride’s and groom’s left and right wrists with ‘blessing strings’. The praises and wishes of happiness, good health, success, prosperity, and long-lasting love are acknowledged and witnessed by the loud sound of the gong and joyful cheers. Then, they throw palm flowers over the new couple accompanied by a traditional song. After the couple is pronounced husband and wife, the groom holds the bride’s fabric into the bridal room accompanied by a traditional song. 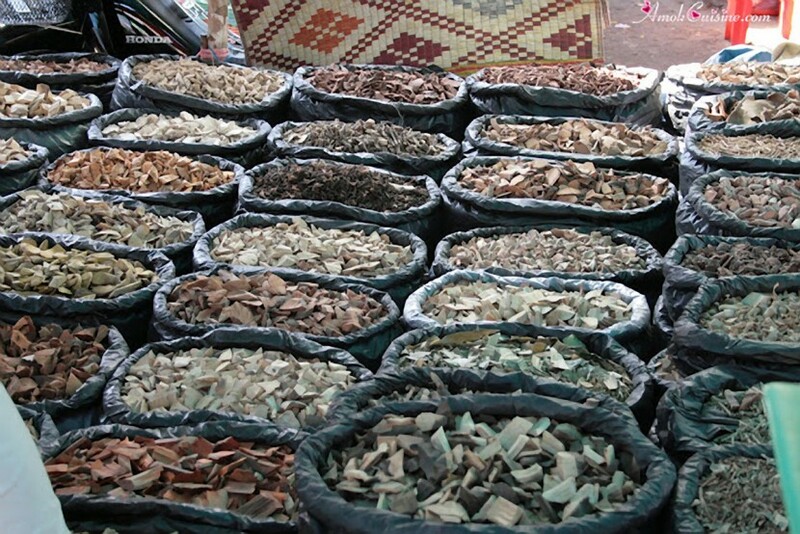 The Khmer traditional medicine is a form of naturopathy using natural remedies, such as roots, barks, leaves and herbs to motivate the body’s vital ability to heal and maintain itself. It has been used to treat various diseases for many years. The ancient Khmer people first formulated this medical lore during the Angkor period. It offers a holistic approach avoiding the use of surgery and drugs. Practitioners of this therapy are known locally as Krou Khmer. Khmer traditional doctors are receiving recognition and training from the government at the National Center of Traditional Medicine. Medical books in Pali text have been gathered from all the pagodas throughout the country; collated and interpreted into the Khmer language at the center.